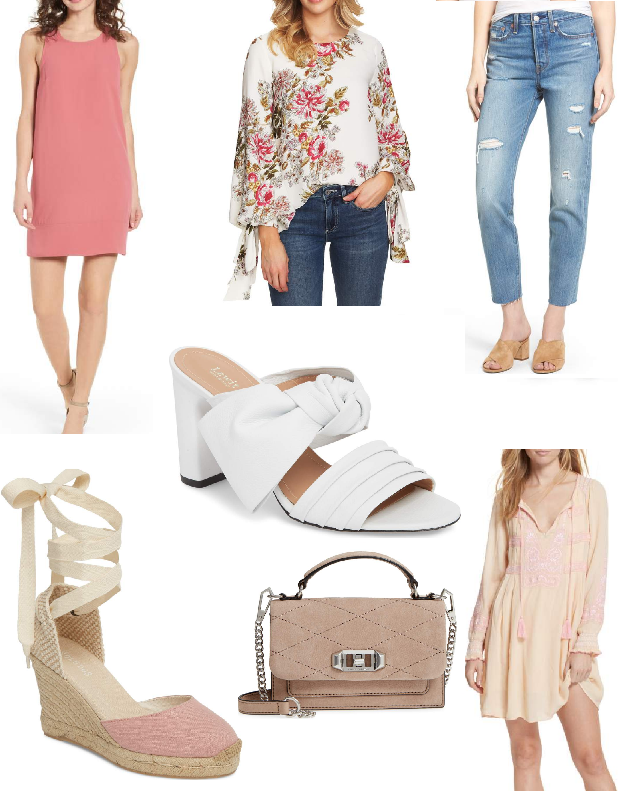 Rosy Outlook: Nordstrom Half- Yearly Sale Picks! Happy Friday loves! Hope y'all had a great week and have some fun plans ahead for the long weekend. Unfortunately for us (and I think most of the East Coast) this weekend is going to be a complete wash-out so I can kiss my plans of sunbathing at the pool goodbye! Most of the weekend more than likely will be spent packing and purging our house. We are trying so hard to get as much done as soon as possible to alleviate last minute stress! I always get so excited for Nordstrom sales because not only are the prices great but there are SO many items included in the sale. It was hard to narrow down which ones were my favorite! Right now I have this Free People dress and white mules in my cart. I have been dying for a pair of cute white shoes for summer and I am ALL about mules! Do y'all have any fun plans for the weekend?! We are headed to Chicago in a couple hours and I am so excited!! So many good picks form the sale!! have a super sweet weekend girl! Have a BLAST! I hope y'all have wonderful weather and an awesome time!! I’m loving your picks, girlie! Those white mules are so cute and would look great paired with any outfit. I say get them! I have a pair I purchased during the winter and wear them nearly everyday. A lot more than I actually thought I would! Thanks for sharing and I hope you have a great holiday weekend! Lovely picks dear! I love the blush pink midi dress, so elegant and chic!